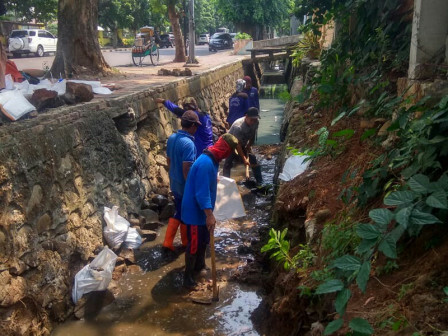 Pulogadung Water Resources (SDA) Unit starts repairing collapsed channel retaining wall on Jalan Layur, Pulogadung, East Jakarta. This 17-meter retaining wall was collapsed on heavy rain day in mid-December.
" We start the work today and our target is to finish it in the next three weeks"
Indra, Head of Pulogading SDA unit mentioned to deploy 10 personnel to repair it. Currently, his side dredges the bottom part to build retaining wall foundation. "We start the work today and our target is to finish it in the next three weeks. We use APBD 2019's self-management fund for this repair," he said, Friday (1/11). That retaining wall was collapsed during heavy rain. Bamboos near the location were also fell on the fence of resident's house. This fence then also collapsed and hit the retaining wall which caused it to collapse.